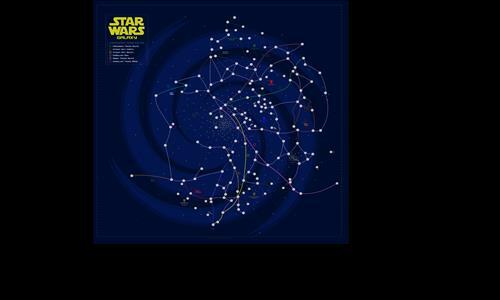 This is a map of the Star Wars galaxy, based on the 'Star Wars: Essential Atlas.' As a medium-sized map, nearly 170 planets & ships of relative key importance made their way onto this galactic chart. Full guide here: https://www.warlight.net/Forum/125010-new-star-wars-galaxy-mapguide. Most planets are worth 2 each, while some are worth 3. Most fleet ships are worth 1 each. Coruscant is worth 4. All other regions or route bonuses are labelled & color-coded in game. More info in the link to the guide provided. Scenario distributions exist for every major era of Star Wars. For FFA games, selecting the proper distribution at the beginning according to how many players there are is important to keep the map balanced from the start. Standard FFA distributions are labelled according to number of players for ease in creating games. Note: This map may not work on some mobile or tablet devices because of its size and detail. Review by Maximus on 1/13/2016. Review by NinjaNic on 12/20/2015. It's a very pretty map, but it's kind of hard to understand. Bonuses for individual stars are not shown, and some of the connections are very long. Plus, all of the bonus colors are the same. But anyway, I think it was well done, and I would recommend to all Star Wars fans! Thanks for the feedback! Planets that are part of a region do not glow that color as it would be redundant; all the region bonuses, using routes, are color-coded, so regions should be clear. As for the bonuses for the planets, they are specified in the guide to the map now created and linked in the description. Putting them in the actual map would have been extremely cluttered. It is a different game than much of what Warlight offers -- the long connections are made for a reason, in respect to the Star Wars universe and actual routes used. It is my hope that many Warlight players can enjoy and appreciate this different style of gameplay which is faithful to the Star Wars universe. In addition, thank you for your kind words. Review by Tarhani on 12/20/2015. Planets and Ships all look the same. It is not easy to see, which of them is worth 1 or 2 or even 3 points until you take a close look. That could be done better. Not a top ten map, but playable. Ship connections are not only color coded, but dotted, surrounded with ships, and labelled nearby by the Fleet text. Even beyond that, all given fleet ships are highlightable by clicking the Fleet bonus sign, and each ship spot is actually slightly smaller than a planet spot. As for how much each place is worth, the overwhelming majority of planets are 2 and the overwhelming majority of ships are 1. Any other exceptions to this are dispersed evenly through the map, and all of them are specified in the description's link to the short guide here on Warlight. Honestly, without changing the nature of the map, nearly everything is there and easy for players to understand if they care to look. Review by Nicholas on 1/26/2016. Review by Franco8807 on 1/26/2016. Nice attention to detail, well designed, and a fun map to play on. Good job. Review by maivilo on 1/27/2016. Review by Artemis on 3/5/2016. Review by Mischief on 1/26/2016. Pleasantly convoluted. Kind of like realising you are inside one's intestines during a lovely sunday brunch, only to find that you are not alone. There are a thousand other small fragments around you. You are food. Review by Alex Cai on 5/28/2017. Review by poi on 7/15/2018. Pros: Incredibly well thought-out representation of the Galactic Civil War in wargame form! Brilliant curation of thousands of locations into a manageable amount. Wise choice of windy pathways and hyperspace routes, the flow is both predictable (in scenario mode, factions end up clustering in a "historically accurate/plausible" way that makes it feel like playing out the book or movie stories) and unpredictable (so many little corners, dead ends, and 5 way intersections make it hard to keep the battle where you want it, allowing for hit and run attacks and getting behind enemy lines). Cons: Although I can hover my cursor over planets for their names, and look up planet bonuses in the description, in the heat of the game these aren't available at a quick glance. My familiarity with the content meant this wasn't a problem (I knew the important planets and routes), but for others it may be. Otherwise the art and interface are very solid. super addictive! 4.7 out of 5, rounded up to 5 stars. Review by fairyfloss on 10/12/2018. Review by chewwweboi on 2/22/2019. Review by Sergio Huerta Lara on 4/3/2018.